Product prices and availability are accurate as of 2019-04-17 23:25:50 UTC and are subject to change. Any price and availability information displayed on http://www.amazon.com/ at the time of purchase will apply to the purchase of this product. 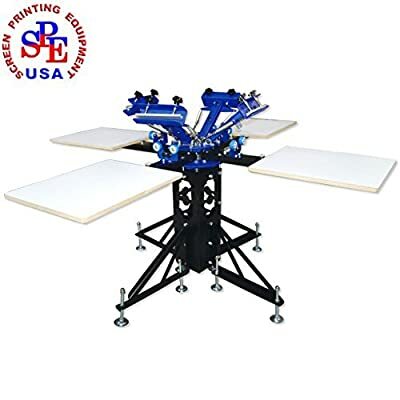 Four-Color Four-Station Double-Wheel Screen Printing Machine can install four-color screens one time, and four-station can print four-color at the same time. Screen plates and station can double-rotation; it makes that multi-color printing, loading and baiting can work at the same time. Printing range is more widely, speed is faster and use is more convenient. It is used for screen printing of clothing and all kinds of craft gifts, particularly suitable for small business and individual printing shop. ?? 1. Whole machine is designed reasonable, simple and more practical. ?? 2. Whole machine adopts desktop combination design. It saves space and is more convenient to transport and transfer. ?? 3. All parts are electroplating or static coating. They are durable, easy clean-up and don't rust. ?? 4. Separate packaging, using four packages and three packages respectively. All exports are in accordance with the United States standards. Machines are separated by high-strength bubble films board; all the metal pieces are completely isolated; place wooden board on the top and at bottom. It makes transfer safer, and the greatest extent minimizes damages during transport. It is more conducive to long-distance transport, particularly suitable for export requirements. ?? 5. 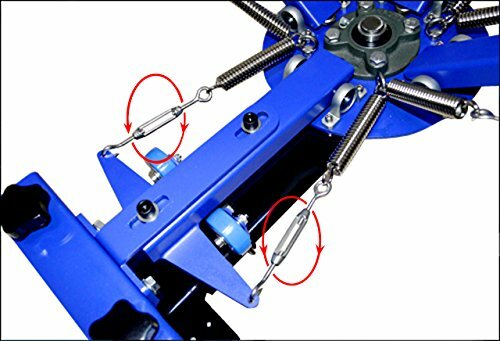 Each machine is equipped with a full set of installation and maintenance tools. 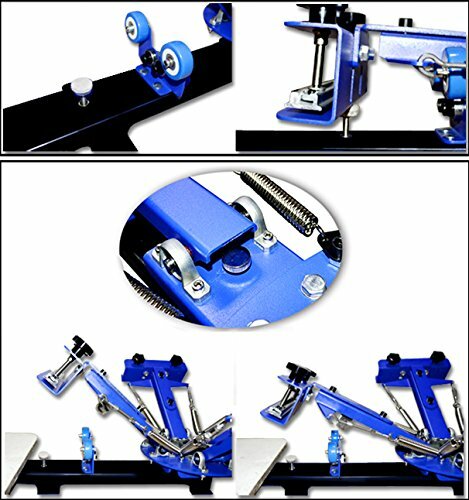 4 Color 4 Station Silk Screen Printing Machine Press DIY T-Shirt Printer Adjustable double-spring devices are available for screen frames of different weight. New design metal stand could adjust the height from 28"-35". 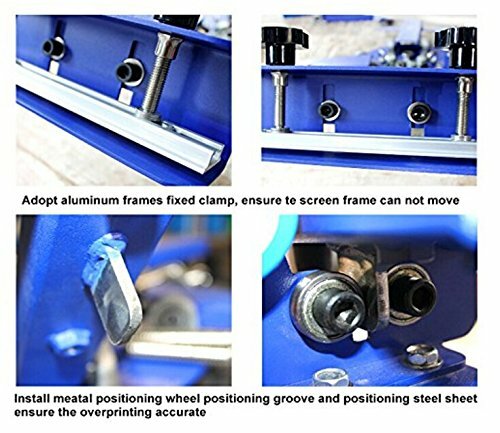 Pallets are fixed on the metal holder, the situation has been set up before selling, you don't need to adjust it. So this will be a good choice for a new hand or someone who want to save cost. We use a rectangle board on this print equipment, it is suitable to print a large image or plane item. 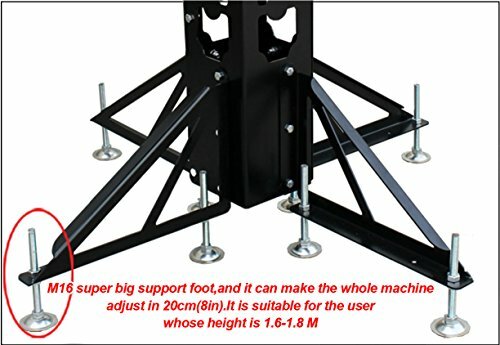 New design metal stand could adjust the height from 28"-35". The installation is also easier than before. 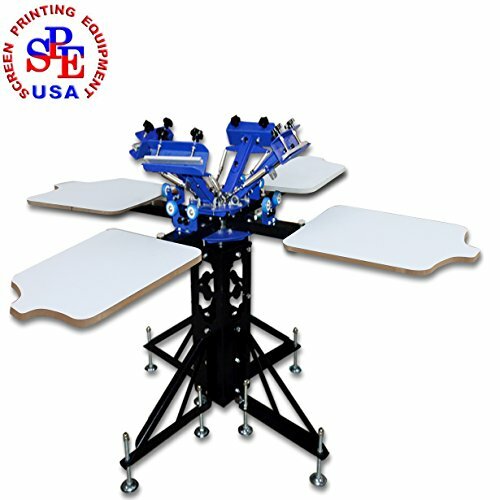 Simple Type 4 Color 4 Station Press Printer This is a simple type 4 Color 4 Station Screen Printing Press. It can apply 4 screens to 4 stations simultaneously. The the screen layer and the pallet layer can rotate independently, which makes it easier for multi-color printing.